While a single photo of a book fair is sure to strike most people as unremarkable, it actually goes a long way in further proving that the school was open, functioning, and quite busy as late as November, 2012. An “Angry Birds” poster. The first “Angry Birds” game was released by Rovio Entertainment in December of 2009, which means that merchandise couldn’t have been available when the school allegedly closed in 2008. This Justin Bieber poster, released in 2010 (again, making it impossible for it to have been available for purchase in 2008, though I’m sure you all understand how the passage of time works by this point, so I’ll let you do the math from here on out). Another Justin Bieber poster, which is simply a much larger version of the cover art for his single “Boyfriend”, released in March of 2012. I know I just said I’d let you do the math, but that’s a long ways away from 2008. 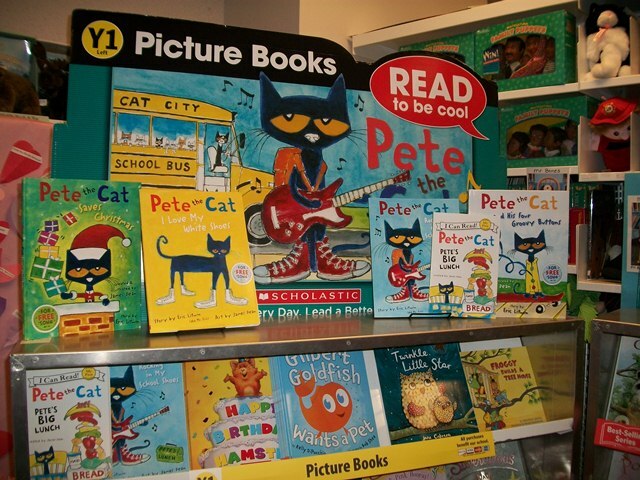 A “Pete the Cat” display. “Pete the Cat” was self-published in 2008 and wasn’t picked up by a major publisher (HarperCollins) until 2010. This display features artwork from “Pete the Cat: Rocking in My School Shoes”, which was released in 2011. I’m sure there are even more that I’m missing (such as what I believe is a display for “Skippyjon Jones, Class Action”, which was released in July of 2011). Not that it would matter much, as we wouldn’t need additional items to established that on November 13th, 2012 – one of the four days a Scholastic book fair was scheduled to take place in the Sandy Hook Elementary School’s cafeteria – principal Dawn Hochsprung posted a photo of a busy book fair, taking place in what has been confirmed as the school’s cafeteria, containing a number of items which did not exist prior to March of 2012 (I don’t think I need to tell you that a photo from 2012 can contain items from 2008, but a photo from 2008 cannot contain items from 2012). And while it has never been backed by any level of actual, empirical evidence, the idea that they’re holding book fairs in what deniers would like you to believe is a filthy, abandoned school only grows more absurd the more you review the available materials. And, as usual, I’m not even done yet. 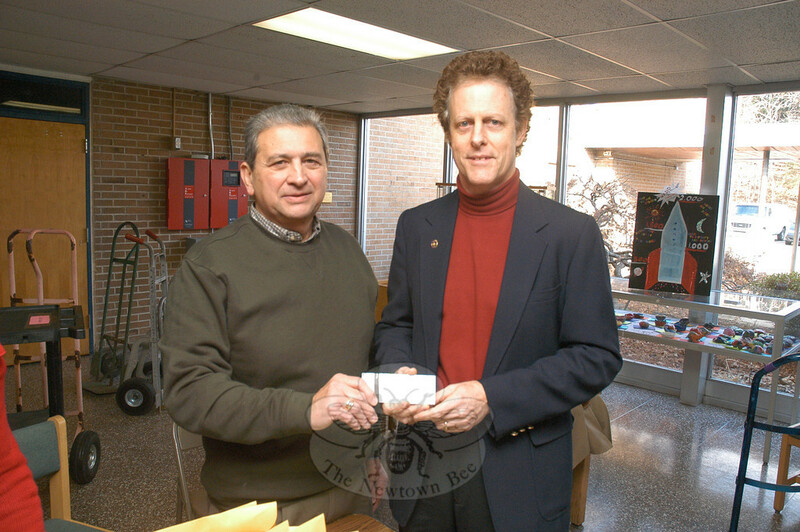 Based on what we’ve already seen, and when combined with a number of other indisputable, timestamped elements, we can be absolutely certain that this photo was taken at some point between November 13th and November 16th, 2012 – during the school’s November 2012 book fair – or only one month before the shooting. Noah was clearly only six years-old at the time, which is relevant because deniers have long claimed that he – along with at least some of the other victims – were actually much older than that in December, 2012. That is of course total nonsense. Because we can use it as a reference point to be sure we’re looking at a series of photos all taken on the same day, let’s start with what Noah is wearing: a dark brown, corduroy jacket with a black Spiderman t-shirt underneath. As CW Wade of Sandy Hook Facts has previously pointed out, the shirt is an “Amazing Spiderman Wall Crawler” youth t-shirt, and it depicts the live action Spider-Man played by Andrew Garfield in the 2012 movie of the same name. As this movie was released that July, it is not enough to nail down such a specific set of dates. But look behind Noah and you’ll see more. This display would not be up at any other point during the school year. Again, these decorations would not be up at any other point during the school year. The Scholastic Book Fair will be at our school Monday, November 12, 2012 through Wednesday, November 14, 2012 and a special Family Event is scheduled for Tuesday, November 13, 2012 at 3pm. The exciting theme for our fall 2012 Book Fair is All-Star Book Fair: Every Reader is a Star! These themes and marketing materials change from fair to fair, so you would not see this sign in use before or after the fall of 2012. So it’s quite obvious that all three photos of six year-old Noah were taken at some point during Sandy Hook’s fall book fair, which again absolutely took place in the open school’s functioning cafeteria between November 13th and November 16th, 2012. The evidence is voluminous and undeniable, and there simply is no other explanation that makes even a lick of sense in any known reality. Another good catch, Brian. I actually considered looking into the history of the sign as I wrote this post, but I think I ended up getting a bit wrapped up in trying to date individual books, etc, and ultimately found it superfluous. identify and model character attributes. With input from the schools and community, this Character Tree was developed to represent Newtown’s Core Character Attributes: Perseverance, Citizenship, Caring, Trustworthiness, Respect, and Responsibility. Each school will be embedding these character attributes in their programs. We hope that you will enjoy discussing these important character attributes with your children. For additional information, please contact Judy Blanchard at blanchardj@newtown.k12.ct.us or (203) 426-2798. Have you written anything about the pre-school classes that were in rooms 53 and 56? Or do you know of anyone that has? Unfortunately I have been very unsuccessful finding anything about them. Did they have different hours and weren’t in session yet that day?